If the Seton Hill Writing Popular Fiction program had class reunions, this would be my five-year. Hard to believe that five years have passed since becoming a Master of the Arts. A lot has changed since then (like my perspective, and more than once) but I was most interested to see the things that hadn't changed. So, in honor of the this week's Writing Popular Fiction Residency and concurrent In Your Write Mind writing workshop, I've decided to post my commencement speech from June 2007. What’s a writer to do with a world that has no more dragons left to slay? No more distressed damsels clinging to the hope that one day, her prince will come? Why write mystery when the scales of justice have already tipped in favor of the hard-working detective who knows he should be home with his kid, but also knows that impartiality, or indifference, has let many a guilty man walk free? Why write horror when the things that go bump in the night have all been named? Why write romance when the world’s last star-crossed lovers have been permitted the triumphant embrace of well-deserved passion? Why write about the mysteries of the cosmos when science has already let us peer to the very edge of creation? After all, it’s just static out there. White noise. There are no spaceships. No wormholes. Why write when we already know what’s at the top of the beanstalk? Anyone who has ever put pen to paper knows that’s not why we do it. It doesn’t matter that some stories have been written, and rewritten long before Homer ever got to them. Some of us simply do it to embrace the journey, and for the feeling we get whenever we put the right words together. 'Alchemy hour' is a term surfers use to describe this feeling that comes whenever a session is just perfect--when the waves can’t get any better, when all the people in the line-up are all brothers and sisters and the only rivalries are friendly. Alchemy hour is that moment when the universe opens up, transmuting the surfer, touching his soul in a way that makes him go to any lengths just to feel that feeling all over again. He’ll get lost in Baja or Costa Rica for weeks, sleeping in his car, surviving on saltines and ketchup just to feel alchemy hour again. Breaks change, swells come and go, but the attainment of alchemy hour is a constant motivator for anybody who’s tasted it. Money and fame don’t matter to those looking for it. The only constant is the way they embrace the quest. Surfers aren’t the only ones looking for this either. In California’s Yosemite Valley there’s a granite monolith called El Capitan. At about three thousand feet high, this rock face is the tallest in the world except for a few in Pakistan. Climbers first cracked El Cap’s secret code during Yosemite’s Golden Era of the late 1950s. In 1958 a trio of men placed bolts and pitons up a route called The Nose and freed the summit in just 47 days. 47 days to go three thousand feet. The second successful summit of El Cap’s Nose wasn’t until 1993, when a young lady named Lynn Hill came along and free climbed it in just four days. Four days--11 times faster than that summit attempt by all those guys way back in 1958. And she did it without using a single piton or bolt. In her book, Hill describes living the glamorous climber lifestyle at Camp Four that summer on just seventy-five dollars. She writes about collecting aluminum cans for a nickel a pop to buy climbing ropes and carabineers, and dumpster diving with black bears at the park lodge, and staking out the cafeteria to scarf French fries and half-eaten hot dogs from empty tables. So my point is not that she climbed it faster than anybody else. My point is that she did it for little more than a feeling. She wasn’t getting paid for her climbs and she didn’t have the support of corporate sponsors. She was pursuing an intangible. Alchemy hour. My own experience with alchemy hour came while guiding rafts down a pair of local rivers. 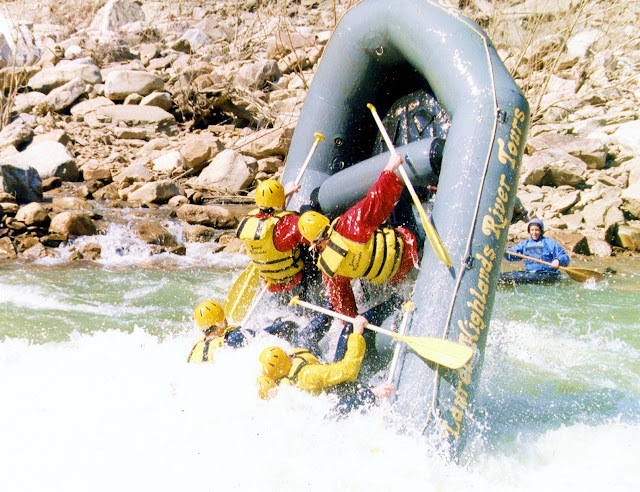 My initiation into the sport of whitewater rafting was flipping rafts and swimming to safety in forty degree water on March weekends. Paddling through driving snow some days. Those first trips demanded the most from us rookies, both physically and mentally, and people quit left and right. I’d recover from Sunday’s trip by Wednesday and still have Thursday and Friday to decide if I was going back on Saturday. There were seventy of us on that the first weekend in March and by the middle of April there were only ten of us still coming back. By the end of April none of us had earned a single dime from work on the river. In the years since those first March weekends I saw customers nearly drown and get back in the raft and paddle away, never knowing how close they were to taking the long nap. One time on the Upper Yough we nearly flipped at a rapid called Meat Cleaver and I swallowed a mouthful of Red Man chewing tobacco. In 1995 we ran trips on the Lower Yough at a water level no longer permitted by the state park because of things that happened on those trips. I saw rapids rearranged by high water on the Cheat River, gave a German nanny a black eye with a paddle, and dated, then eventually married a booth babe. I didn’t have money in the bank. My pockets were always empty. But who needed money when they had all THAT? And when I quit rafting to move to Florida with Heidi, I was afraid that I’d never find alchemy hour again. I’d resigned myself to the fact that it wasn’t attainable by working at a hotel. But that’s when I started writing. Writing has let me do everything I’ve ever wanted to do. I’ve seen more of this world through a writers’ eyes than I ever would’ve as a raft guide. And I operate on the firm belief that the best is yet to come. For those of us that are still seeking our first fiction publication all we have to go on is the feeling we get with minor successes and the hope that, one day, our heroes will become our peers. Until our work ends up in print it’s little more than ones and zeroes in a word file. It intangible, like characters that keep us up at night and ticking clocks and word counts and query letters. The intangibles are what drive us. One of the most important intangible on my quest so far has been the Seton Hill community. We’re lucky enough to have those writers who have walked this stage before us to show us how it’s done, and we have those writers who will come after, to remind us that what we do today might not be good enough tomorrow. The people that I’ve met here--whether critique groups partners or comrades in genre--are bright spots in what can sometimes be a lonely pursuit. Back in 2005 I really didn’t think I had much in common with the people I was going to school with except for the one I was married to. But in just 2 years I’ve had more than my fair share of great moments. Playing Milk Money at Balticon. Driving through a hurricane to attend a Pirate Party in New Jersey. Saturday Night Eighties bands at the Sheraton Greensburg. Wednesday night chats. Sneaking away from CONTEXT to chow on White Castle’s delicious sliders. A party at the Hampton in January where certain events are only rumored to have happened. Thursday’s wine social could now on my list. Yeah, I’ve had alchemy hour a few times since signing up for this thing. And for me, the best part is the quest continues. Getting this degree isn’t an end by any means. It’s the first of many beginnings. We’re extremely lucky to have a fantastic faculty to usher us out of the nest and into the world of publishing. I’d like to take this time to thank Lee McClain, Al Wendland, Mike Arnzen and the rest of the Writing Popular Fiction staff--mentors, workshop and module facilitators . We’re grateful because we don’t have to look very far to find wonderful examples of writers living the writing lifestyle. Our very own Dr. Arnzen embodies the writing spirit better than most. He lives how a writer should live. I’ve only known him for two short years, and somehow he’s been on sabbatical the whole time. Every time I talk to him his intensity and passion for the written word have profound effects on me. In fact, after spending an afternoon with him last September my appendix ruptured. I had emergency surgery early the next morning. I’d also like to thank administration for helping to make this wonderful experience available, and make a special thank-you to Wendy Lynn for all of her help. Many of us owe her an acknowledgement in our first novels. Some of us have to name our first child after her. These people have made Seton Hill a place where writers can pursue their quest, no matter what form it takes. And I think it’s important to acknowledge this graduating class, seated here in the first row. It’s a small one composed of seven very different writers. Despite varying hardships they’ve managed to write some good stuff. And from them we all should expect great things. To complete a novel is no easy feat. And to write multiple drafts that will be subjected to the scrutiny of professional writers and critique groups takes some backbone. We began this not knowing that following our dreams was going to be so difficult. We write, then rewrite, then write again and when we’re finished all that we have is more paper. Our thesis and a diploma. To me, those aren’t any more important than the intangibles I’ve accumulated over the last few years. The friends I’ve made, the knowledge I’ve gained, the alchemy hours I’ve spent at my computer, at residency, with other writers--for these I would gladly continue this quest. Why are we here if not to create fiction? To find stories, to create stories, to tell stories, to live stories? That is our journey. Alchemy hour is a bonus. We, the writers, get to decide if the damsel needs rescued. Or if it’s the damsel herself who does the saving. We, as writers, know that justice isn’t blind even though juries may be. As long as there are beat cops and two-bit criminals, botched break-ins and cold cases there will be stories worth telling. We know that the monsters man creates are euphemisms for the things we fear in our everyday lives. Who doesn’t get a little Jack Torrance when all work and no play makes one dull? The monsters that writers create are meant to take our minds off of the things that really scare us. We know what the edge of this universe looks like, science has shown us. But this universe is just one of trillions where faster-than-light travel and dimension hopping could still be possible. Voyages to Mars and twenty-thousand leagues beneath the sea first came to life beneath the pen of a writer. And we know what’s at the top of the beanstalk. No doubt it was some grumpy writer who put the giant up there. But giving Jack the hatchet... That was alchemy hour at work. It's a shame you don't have a donate button! I'd most certainly donate to this excellent blog! I suppose for now i'll settle for bookmarking and adding your RSS feed to my Google account. I look forward to fresh updates and will share this site with my Facebook group. Chat soon! Thank you! You kind words mean a great deal to me. Going to check out your site now. And no donations here. I'd like to give people something for their money. That's why I keep the price of my eBooks at $2.99. Awesome reminder to live life to its fullest. Did you see the comment above where I replied to the spam? I'm going to leave it up as a symbol of my naivety. Which, in a way, was what the speech was about, right? Idealism is probably a better term, but what's the real difference? I think it's always good to keep a little naivety in your pocket at all times.